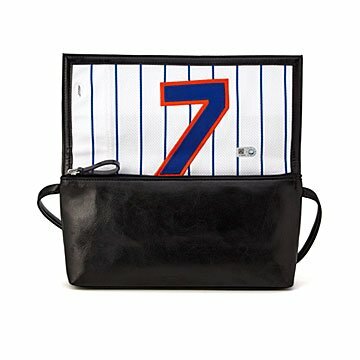 A home run of a handbag, this unique design features an interior lining made from a game-used MLB jersey. Interior lining made from a game-used MLB jersey? Admit it, you're fan-girling over this handbag. It's a sleek, one-of-a-kind way to carry your team around with youwhether to the stadium or just dinner in town. Each piece of baseball history is hand-cut and selected to feature at least two colors of their iconic uniform. Since it's fresh-off-the-field, the fabric will show varying amounts of wear. And if you're lucky: the faint, intoxicating scent of post-game Derek Jeter (sigh). It's a home run gift for the friend who lives for game night. Designed by Ward Wallau. Handmade in India. Officially licensed by Major League Baseball, each bag includes a tamper-evident hologram sticker on the uniform piece to ensure authenticity, and comes gift-boxed with an authentication instruction card.